The Clean Clothes Campaign (CCC), the International Trade Union Confederation (ITUC), and the International Textile, Garment and Leather Worker’s Federation (ITGLWF). The campaign is also supported by a diverse coalition of organizations worldwide. 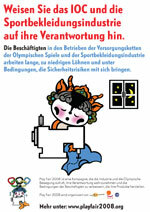 We support the aims and demands of the Play Fair 2008 Campaign. We believe that sportswear and athletic footwear companies, the International Olympic Committee (IOC), National Olympics Committees, as well as national governments must take steps to eliminate the exploitation and abuse of workers in the global sporting goods industry. RESPECT WORKERS’ RIGHTS IN THE GLOBAL SPORTING GOODS SECTOR! 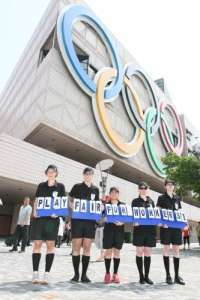 Play Fair 2008 is an international campaign taking place in the lead up to the 2008 Olympic Games to push for respect for workers’ rights in the global sporting goods industry. Read our complete campaign statement (pdf format), which details the steps that sportswear and athletic footwear companies, the International Olympic Committee, National Olympic Committees and national governments should take to follow up on their responsibilities to improve conditions in the sector. 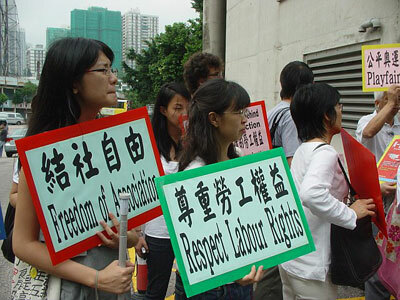 3 August 2008, Hong Kong – Campaigners in Hong Kong, backed by the Play Fair 2008 global coalition, have today confronted the International Olympic Committee for its failure to act on widespread exploitation of workers in the manufacture of Olympics-branded products.